The extravasation of milky chyle into the peritoneal cavity is known as Chylous ascites. A true chylous effusion is defined as the presence of ascitic fluid with high fat (triglyceride) content, usually higher than 110 mg/Dl. This can occur de novo as a result of trauma, neoplasm, obstruction of the lymphatic system as well as many other causes that have been described in the literature. It can also occur as a secondary event, this is when an existing clear ascitic fluid turns chylous. 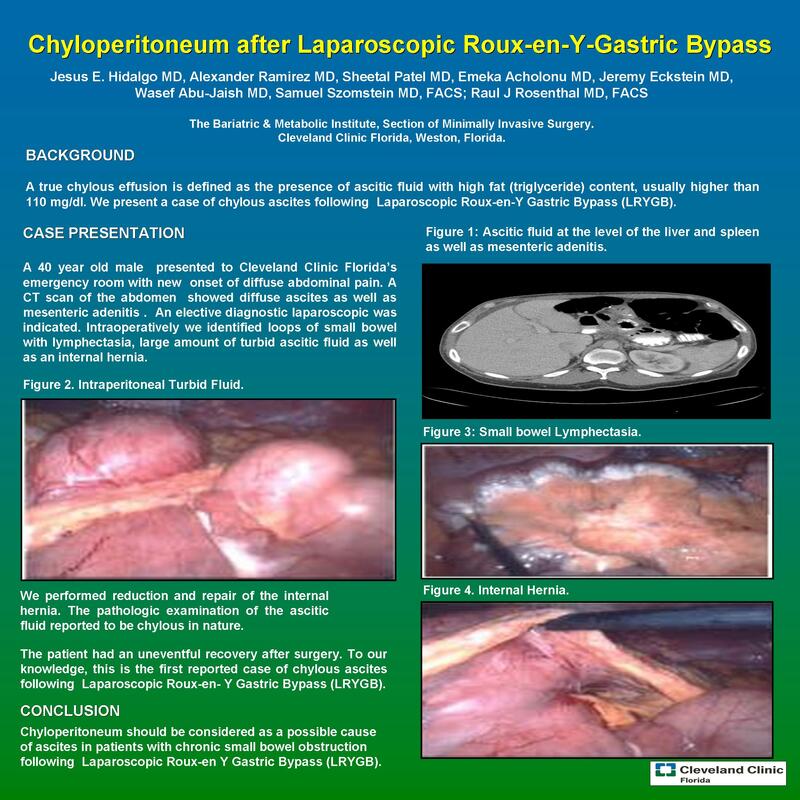 Laparoscopic Roux Y Gastric Bypass (LRYGB) has assumed a central role in the surgical treatment of obesity; we present a case of chylous ascites following a Laparoscopic Roux Y Gastric Bypass (LRYGB). We report a case of Chyloperitoneum fallowing a Laparoscopic Roux-en-Y Gastric Bypass (LRYGB) with 100 cm alimentary and 50 cm biliopancreatic limb in a 40 year old male patient who was admitted for surgery on May 31, 2007. The procedure was performed without apparent complications. On August 2008, an Abdominal CT with contrast was ordered, it showed ascites at the level of the liver, spleen, and right paracolic gutter as well as mesenteric adenitis. On September 2008, the patient is admitted to Cleveland Clinic Florida due to a chronic abdominal pain of unknown etiology. The patient is schedule for an elective diagnostic laparoscopy and possible reduction of internal hernia and closure of a mesenteric defect. Upon inspection of the abdominal cavity, it came to our attention that there was a large amount of chylous fluid accumulating in the right upper quadrant (RUQ), cul-de-sac and left upper quadrant (LUQ), a specimen was sent for microscopic analysis which came back negative for any bacteria. The loops of small bowel showed signs of lymphectasia, in addition an internal herniation of the common channel was also found. The patient made an uneventful recovery after surgery. To our knowledge, this is the first reported case of chylous ascites following a Laparoscopic Roux Y Gastric Bypass (LRYGB). Chylouperitoneum should be considered as a possible cause of ascites in patients with chronic small bowel obstruction following a Laparoscopic Roux Y Gastric Bypass (LRYGB).